Get Your Own "Run With Her To Rio 2016" Tshirt Today! You are invited to take a look at various articles, videos, and photos that reflect Ivonne’s character, passion, and enthusiasm in every aspect of her life. 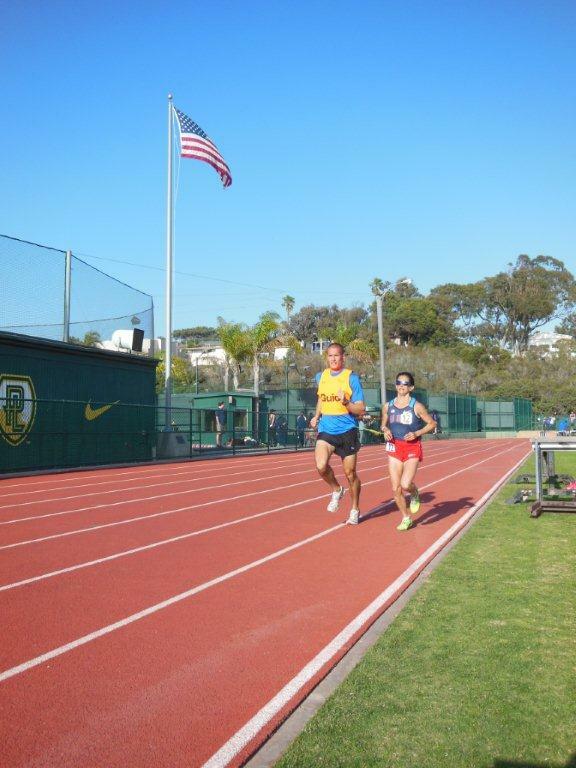 Picture of Ivonne and Paul Coover (guide) running at the 2014 Point Loma Track Meet. In the May 2014 issue of Triathlete Magazine - Amanda McCracken writes about her experience guiding Ivonne at the 2013 Paratriathlon World Championships.Click here to read the article! Ivonne Speaks to the Press just days after the tragic bombing at the 2013 Boston Marathon, and just before running the 2013 London Marathon. Read More! Philly Magazine, 2012 - Ivonne shares her experience of “Running Blind: Racing Through The Eyes Of A Disabled Triathlete”. Click here! News Release of Ivonne’s 4th National Paratriathlon Championship – Midland Daily News, 2010. Read On! Ivonne is a recipient of the 2008 WOMEN’S HISTORY MONTH AWARDS in New York City. Read the Governor's announcement! Associated Press, 2005 - Ivonne speaks about why she’ll be running in the 2005 New York City Marathon. Check Out her Motivation! A New York Times article with an early sneak peak into Ivonne’s dance career with The National Dance Institute. Read the article from 1989! Watch Ivonne, as a gifted fourth grader, narrate a year of her life in the award-winning documentary “Into The Mainstream”. She’ll tug at your heartstrings, make you laugh, and inspire you as she studies with friends, learns Braille and math, navigates the streets of New York City. In a year’s time Ivonne also begins to explore athletics, cycling across the George Washington Bridge, reflects on her dreams, and answers probing questions with wisdom and sincerity.Click here to watch the documentary! Scribe Media, 2007 - Watch an interview with Ivonne about The Achilles Track Club – By Coco Ballentine. Scientific American Psychology Textbook, 2015 - Watch Ivonne and John swim, bike, and run as she trains for the 2016 Paralympic Games. Bring Ivonne into your organization, via the most convenient method for you, and begin to transform the Diversity landscape around you! She can visit with you in person, via the web including Skipe, or by phone. E-mail Ivonne for additional information or with any questions! ©2009-2017 Copyright Ivonne Mosquera-Schmidt all rights reserved.